Innovation Week Birmingham, presented by PNC Bank, wraps up today, with nearly 30 events around the city that celebrated innovation in Birmingham and the inventors, investors, entrepreneurs, supporters and catalysts that drive it. 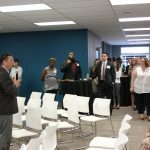 Innovation Week Birmingham is designed to be an open platform to showcase the numerous organizations and initiatives that support the Birmingham innovation ecosystem and the talented workforce that drives it. Partners for Innovation Week include the Birmingham Business Alliance, Birmingham Venture Club, City of Birmingham, Economic Development Partnership of Alabama, Innovation Depot, REV Birmingham, Southern Research, TechBirmingham and the University of Alabama at Birmingham. The Innovation Week Birmingham partners would like to thank PNC Bank, which was the presenting sponsor for Innovation Week for a second consecutive year, and other sponsors America’s First Federal Credit Union, Protective Life Corp. and Spectrum Enterprise. Arthur J. Tipton, Ph.D, addresses attendees at the BBA's Business@Sunset at Southern Research. Innovation Week partners cut the ribbon on Innovation Week. Ray Watts, President of UAB, speaking at the Innovation Week Ribbon Cutting.